The major objection to Elementary before it debuted was its apparent superfluity, but that objection no longer holds water; there’s something gratifying in knowing that for once, the cynical (and sensible) reaction to the news that two different networks were developing the same source material was proven false. While Sherlock’s playful style and Tumblr-friendly leads have their pleasures, the show also has some significant flaws, flaws that Elementary, in its low-key, airs-on-CBS-so-we-all-assume-it’s-for-old-people way, has largely avoided. 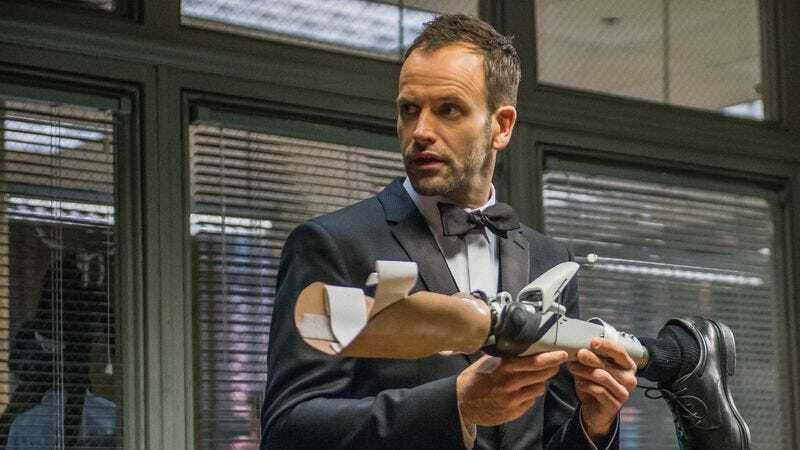 Shocking as it may be, considering their relative positions in the pop culture zeitgeist, Elementary is a fundamentally better series, with a richer supporting cast, a more consistently rewarding structure, and a far more compelling perspective on its protagonist. Sherlock’s episodic design is both one of its great strengths and its biggest weaknesses. British television seasons (or series; we’ll stick to “seasons” here to avoid a bad comedy routine) are typically shorter than American ones, but Sherlock takes this to the extreme, with only three episodes per season, each running roughly 90 minutes. On the plus side, this allows for greater dramatic builds, as movie-length stories are allowed to play out without needing to break into smaller, 45-minute chunks. But the limited episode number makes for a severe shortage of distinct mysteries. By and large, each Sherlock entry keeps its focus on a single plotline, and while the best episodes have enough twists and turns to keep that line from dragging, there’s little of the comforting regularity that Doyle’s fiction generally delivered. The few Holmes novels aside, the detective’s main presence was in short fiction, and its familiar routines work best in the aggregate. By limiting the characters’ exposure, the BBC series puts substantially more focus on big moments and iconic surprises, often to its detriment. And in those cases when a mystery fails to live up to snuff (like, say, “The Blind Banker,” with its dimly racist Orientalism, or “The Hounds Of Baskerville,” which comes perilously close to Scooby-Doo territory), it means a third of a season’s worth of plotting wasted. Even Elementary’s take on Watson is more complex and interesting. The Sherlock version is perfectly acceptable: Freeman is well cast, and does a fine job of switching between outrage, awkward double takes, and astonishment. But it was established in the first episode that Watson’s war experience (he served as an army doctor in Afghanistan) had deeply affected him, and this has been largely forgotten, outside of the occasional tossed-off bit of dialogue. Though he’s given the dignity of outside work and occasional love interests, Watson’s main job is to react to Sherlock. As Joan Watson, on the other hand, Lucy Liu gives life to one of the stronger female roles on network television, a former surgeon turned sober companion who first meets Sherlock when his father hires her to help him go (and stay) drug-free. Over the course of the first season, Watson helped bring balance and perspective into Holmes’s world, while he, in turn, offered her a glimpse of the challenges and gratification of investigative work. It’s an equal partnership that allows Watson agency and standing without diminishing Holmes’ gifts. The key difference between Sherlock and Elementary comes down to the way each show treats its protagonist. Everything in Sherlock revolves around Sherlock. He is the series’ sole reason for existing, and the dynamic remains frozen in amber. Sherlock will do something outrageous, everyone will gasp, but then he’ll solve a crime or offer a token gesture of commiseration, and everyone will move on. It gets old, because the show simultaneously wants its audience to be shocked by Sherlock’s behavior, and charmed by his roguish self-regard and evident brilliance, without much variation. Elementary takes a broader view. As Sherlock, Miller is often standoffish and arrogant, but he exists in a world that refuses to let him off the hook for his mistakes or his behavior; better still, he recognizes his failings, and is clearly working toward addressing them. This doesn’t mean the series is about “fixing” Holmes, or even that the character is inherently broken, but it allows for the possibility of growth and change. On Sherlock, Holmes is constantly bemoaning that he’s surrounded by idiots, and it’s hard to argue his point. On Elementary, Holmes is engaged in the slow, painful process of accepting that those “idiots” might have something to teach him. The former has its moments, but the latter makes for better television and more rewarding art.